According to mythology, Lord Vishnu had cut off the body of Mata Sati into 51 pieces with his ‘Sudarshana Chakra’ and all these pieces fell at different places throughout the country and these places are known as ‘Shaktipeeths’. 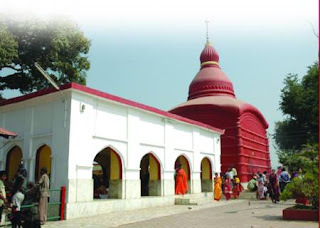 It is said that 'right foot' of Mata Sati fell at Matabari on the southwestern outskirts of Udaipur town, headquarter of present south Tripura district of the state. This ‘pithasthan’ (centre of pilgrimage) is also known as Kurma Pith because the shape of the temple premises resembles that of "Kurma" or tortoise. The idol of ‘Maa Kali’, presiding deity of the temple, stands in the sanctum sanctorum and it is made of reddish black stone, popularly known in Bengali as ‘Kashtipathar’.